Thanks To RJ Sucharita, This Visually Challenged Student Can Now Continue Her Education! This incredible visually challenged girl’s story is nothing but an inspiration! We normally think that people in Mumbai are too busy to care for anyone, but this story prove this notion otherwise! Very recently, Mumbaikars came together to help a visually challenged girl. This initiative was started by famous RJ Sucharita Tyagi. 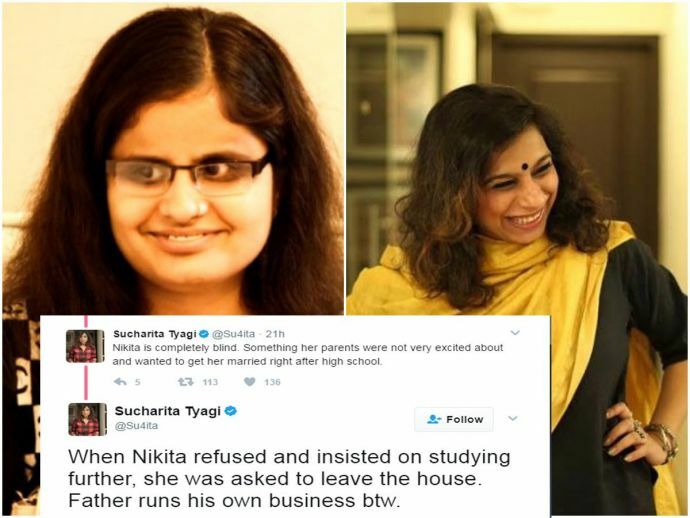 Sucharita told this incredible story in a series of tweets, yesterday! Nikita Shukla, a 21-year-old law student won a radio contest and went to the radio station to collect her prize where she met RJ Sucharita Tyagi. Nikita is completely blind and maybe this was the reason her parents wanted her to get married right after her high school. However, Nikita refused and insisted on studying further, but her urges were left unheard and she was thrown out of the house. Nikita is completely blind. Something her parents were not very excited about and wanted to get her married right after high school. She was clueless and disheartened and wanted to move to Mathura, but when her friends convinced her to stay back and continue her education she agreed. Things were not so easy for Nikita when she started staying away from her parents. Although, with the help of few donations and help from fellow college students and professor, she could continue her education. But the money was just not enough to feed her, twice a day! Enough for her to pay her fee little by little. She's borrowed from friends, sometimes kind professors even. A few small scholarships. RJ Sucharita was so moved by her story that she felt she must help this young and talented girl. Hence, she used her story in some of the shows. And surprisingly, people stood up to help her without asking any authenticity. Finally, the efforts of RJ counted and they made enough money for her college education and hostel fee. In today's world where we only hear stories about crimes and wars, incidents like these restore our faith in humanity!